Golden Celebration (AUSgold) is possibly the most beautiful golden yellow English rose in commerce. This lovely rose is classified as a "modern shrub" by the American Rose Society and comes to us from legendary British hybridizer, David Austin. It was introduced in England in 1992 and is a cross between Charles Austin x Abraham Darby. These beautiful shrub roses bred by David Austin combine the romantic form and intense fragrance of antique roses with the additional benefit of remontance, the characteristic of modern roses, which causes them to rebloom. Golden Celebration is no exception, and it is quickly becoming one of Mr. Austin's most popular rose introductions. In the words of David Austin, Golden Celebration is "one of the largest-flowered and most magnificent of our English Roses". This is most probably due to its bountiful flower size and luscious golden yellow color , which does not fade as the blooms age. The magnificent individual blooms are deeply cupped, often measuring five inches in diameter; and they average 55 to 75 petals each. The inner petals curve inward, while the outer petals gracefully reflex back for an extremely elegant effect. The ample blossoms of this rose are held loftily upon arching stems, and the foliage is of dark glossy green, which shows off the flowers to perfection. 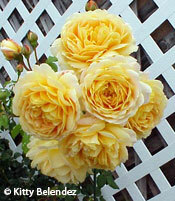 The Golden Celebration rose has a rounded growth habit of about 4.5 feet x 5 feet as a shrub rose. This rose can also be grown as a short climber up to eight feet tall or more in warm climates. In some Southern California gardens, I have seen Golden Celebration grow into a rather large climber, and it can be trained to grow over arches as well. It repeat blooms in spring, summer and fall, and does best in full sun. It is also relatively disease resistant, which is always a plus in anyone's garden. Another highly desirable quality of Golden Celebration is that it is exceptionally fragrant! This rose offers up an incredible, heady perfume that is second to none! To me, it gives off a sweet, intense old rose scent. I have also heard opinions of its fragrance that include "the scent of sun-warmed honey," "a powerful fruity fragrance with an essence of strawberry," "tea and fruity," "strong and spicy," "ripe peach and tea rose", and "a wonderful combination of sauterne wine and strawberry". Golden Celebration is also a really great show rose. It exhibits successfully, not only in the modern shrub division (see the photo of my Best Modern Shrub trophy winner at the 2002 PSW District Show), but also in a variety of other categories including the rose in a bowl, rose in a picture frame, and in the Shrub English Box (see the photo of the award-winning box shown by Bob & Dona Martin at the 2004 Mesa East Valley Rose Show). In conclusion, Golden Celebration is undoubtedly one of the finest English Roses on the market for both the home gardener and the show table. It is available from David Austin Roses (www.davidaustinroses.com), and at selected fine nurseries. © Copyright Suzanne Horn. All rights reserved.